This DMX300 is a master controller that you can use to control many RGB strip lights.All you have to do is connect the DMX300 to a PX24500 receiver using a cat5 or cat6 cable. The PX24500 can also be purchased from our site. Each PX24500 can be hooked up to 2 RGB strip lights. You can daisy chain the PX24500 up to 150. This means you can control 300 reels of RGB strips with this master controller and all of the reels would look the same. 256 RGB color models, total 16.77 million colors, true colors. Build-in multi-Mode selections with Pause function. Can be re-programmed by some updated software (Optional). 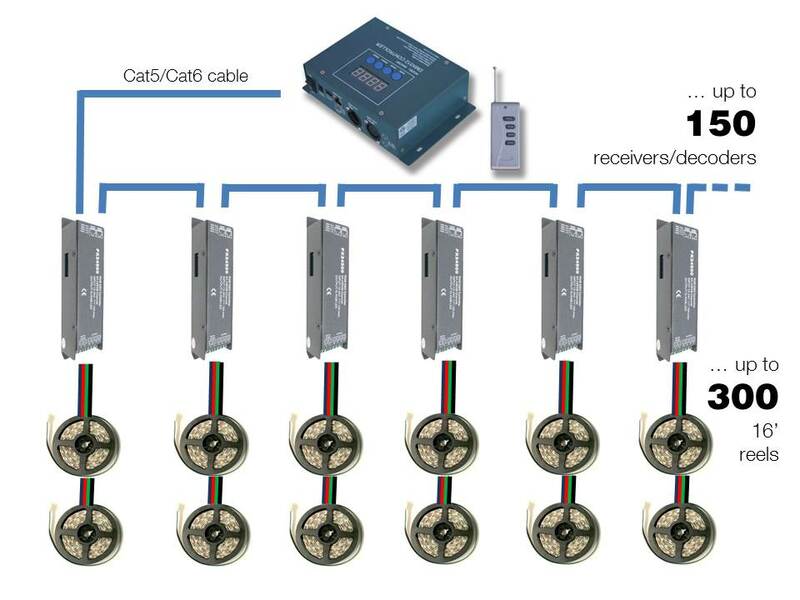 Support various output interface, such as XLR-3 Male & Female, RJ45 etc. ETL certified to be compliant to widely accepted product safety standards. 12V Nova Bright Color Changing RGB High Lumen Super Bright LED Strip Light 6 Ft Reel 120 LED on a 2m strip. Comes with Remote and Power Cord. Change colors using your remote.